ProxiMat(tm) - Your "mouse pad" while in VR. This mat was specifically designed to give the best understanding as to where you are and what your movement range is while you are using virtual reality. Additional benefits are derived from the commercial grade anti-fatigue composition of this mat. The ProxiMat(tm) VR Spacial Proximity mat is designed to improve your experience in virtual reality whether you are tethered by cables or using a wireless casting device for full freedom of motion. 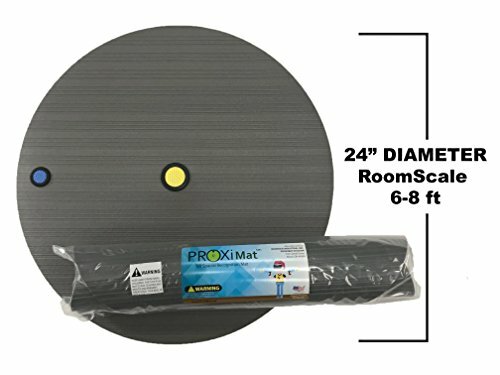 ProxiMat has a unique round design with raised indicators in the front and center of the mat to give you tactile feedback as to your location on the mat and in respect to the room. It works well in conjunction with your system's activated chaperone system - giving you touch and visual feedback as to your position while immersed in virtual reality. Product radius varies by user height and reach, averages given in room scale usability. Made from durable 3/8" Thick commercial grade anti-fatigue sponge. This mat can also be used for VR Drone Racing where the pilot is stationary or is required to have limited movement. It also allows for longer periods of standing and helps with the discomforts associated with stationary or limited mobility. The diameters of the ProxiMat(tm) are designed to give tactile feedback with both feet, one foot and no feet on the mat (which tells you that you are outside of the safety zone) The buttons in the mat provide tactile feedback as to the center and front of the mat. Please note that controllers are not included - shown for sizing. Works with hardwood floors, concrete, tile, commercial low profile carpet only. Great for long standing sessions with commercial anti-fatigue sponge construction. Use socks or bare feet for best tactile awareness. Reduces Vertigo. If you have any questions about this product by ProxiMat, contact us by completing and submitting the form below. If you are looking for a specif part number, please include it with your message.